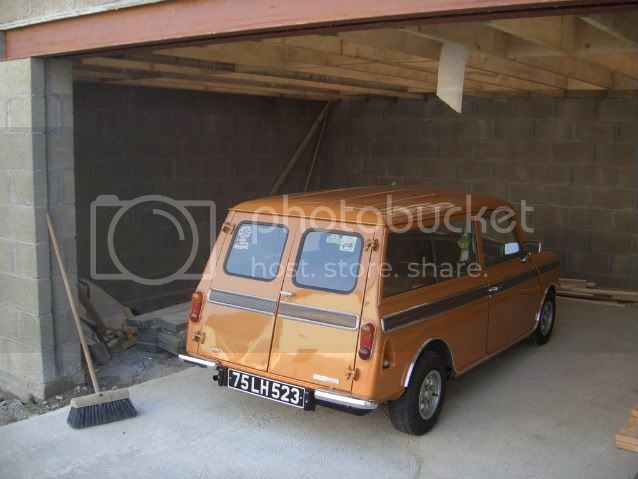 Am looking for garage to put mini in,want one 11 foot deep and 10 foot wide, did any body ever get one made this size.I have looked at a few places but they only want to do standard sizes.Need double doors on it 6 foot wide hanging from left side of front as you face it. 11' x 10' - enough to store 2 Minis side by side! Tom, I've done a bit of checking on these as well and apparently they work in sheet widths i.e. 3 foot or 1 metre, you'd want to check. So the typical sizes would be 12',15',18' etc. It's when you start slicing sheets to get different sizes, it causes extra work for the manufacturer. What I ended up doing for a 10'x10' garage extension was to get RSJs (girders) set in concrete and a frame welded up. The guy who did it for me then cut the end sheets to size with an angle grinder. Call over to me sometime if you want to see. Saw theire site [SHANETTE SHEDS] sent them email was sent reply saying they would get back to me,have not heard anything since.That was last year. Quick question does that 7k include the concrete base ??? I've called down to them and found them great to deal with. No that doesn't include the case. I got two builders to quote me and them each came back with 4,500. So i'm doing it myself with a help from a few polish guys and i should have it done for about 1000 euros. Before you pour concrete, have you considered putting in a pit and lighting for it? There's pros and cons of a pit but one of the cons is dropping a leadlamp and igniting petrol fumes. Very Nasty if it happens. Ideally you should build in stairs for quick exit. Also there's a great readymade pit supplied by a UK company called Mechmate. You'd see it advertised in Practical Classics or just google mechmate. Oohhhh the envy... you guys with space to build! I suggested to her indoors that a garage in the front garden might look nice... i could paint flowers on the outside... she suggested i might put a bunk in it for myself. subject closed! Belive me it wasn't easy to get ground clearance for the garage (and not from Meath county council) but after moving 3 times in 4 years the boss had to grant it. With 2 small kids a pit would be nice but wouldn't be practial. a sheet of steel makes a good lid. its also heavy enough so that the little people cant open it until they are old enough to be careful. I am going to chance putting it up in front garden as i have no back, I have the concrete done allready.If i had a back i would build it myself, might still do it myself if i can source proper sheeting so that it will look proper.I am in a corner house with a triangular shaper garden in front. you can always encourage some greenery to grow up and around it.. kinda like camouflage? There is several free ads looking for free removal of sheds! Still have not got one must make more of an effort over next few weeks.Plenty of work ahead of you so. I,ve cut the concrete slab along the garage last week to get ready for digging the foundation this weekend and weather permitting I will get it dug over the Easter weekend and get the foundation poured after the Easter break.Only drawback from this is no mini work being done. I just spent the last two weekends working in a gazabo, can't wait to get the garage built. I dug out the foundations for the extension to the garage over the Easter weekend and I poured the foundations the following Monday.The blockwork is finished and I,m hoping the chippie will get the roof on before the weekend.The size of it is 20ft by 17ft so should fit a few minis in there.I gave up trying to get anything done on the RSP or the van due to lack of space on the garage so when this is water tight I,ll get cracking on the projects again.I will post pics tomorrow. That sounds like good work. I see the van made MiniWorld! Heres a picture of work to date. I brought the estate out of storage to do a few jobs to it,including new rear shoes and a rear cyclinder,two new rear shocks,two drive shaft seals and a service to get it ready for the IMM. 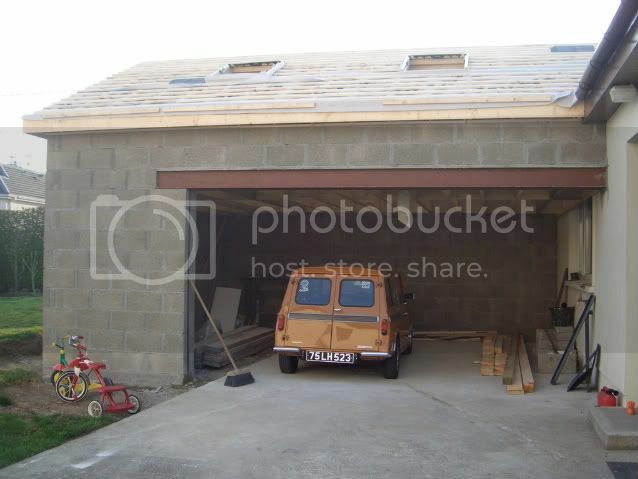 And another one,hope to have the roof finished next week and get the inside plastered so that I can put the floor down.It is big enough to store two projects and two road going cars.